Fire Note Says: Luther Dickinson brings together some up & coming female folk/rock singers, who collaborate for a long weekend, singing each other’s songs and the result is a delight. Album Review: As Luther Dickinson describes it, Solstice came together like a potluck dinner where new friends meet and share some of their favorite recipes. The result is a sumptuous feast as talents, voices and mutual admiration creates a soothing harmony that’s so sweet and satisfying that it lasts late into the night. Of course, a lot of the magic here comes from the female voices that came together to become the Sisters of the Strawberry Moon for four days of recording at Dickinson’s Zebra Ranch Studio in Independence, MS. Some of the finest roots music singers made up the Sisters: Amy Helm, daughter of The Band’s drummer & vocalist Levon Helm, and a recording artist in her own right; Alison Russell of The Birds of Chicago (the band that backed up Helm on her 2017 Yep Roc album, “I Shall Be Light”); Amy LaVere, who had played with Dickinson in The Wandering, a blue grass group; Sharde Thomas, who comes from the Mississippi delta blues, fife and drum band tradition; and, The Como Mamas, three Mississippi Gospel music singers, Ester Mae Smith, Angela Taylor, and Della Daniels. These women all brought their own songs to the party, but passed the mic around, and sang harmonies on each other’s songs, and, from the sound of it, a good time was had by all. The whole album, 12 songs in all, has the feel of a bunch of friends sitting around with guitars and other instruments passing songs back and forth. Dickinson, who has built his reputation around two decades worth of recording and touring with the North Mississippi Allstars, plays guitars including a lot of the leads, and he’s supported by several musicians for The Birds of Chicago – JT Nero on acoustic guitar and Drew Lindsey on piano and keys. Dickinson co-produced the Birds last album, “Love In Wartime.” And some of the Sisters added their own musicianship, LaVere on upright bass, Russell adds some banjo and clarinet, Thomas plays drums and fife. For additional spice, and with the basic tracks and vocals recorded in 4 straight days, Dickinson brought in a few more players: Lillie Mae Rische who adds fiddle to two tracks; Will Sexton, LaVere’s husband and brother to Dylan guitarist Carlie Sexton, added guitars to the three songs she played lead on; and, Alvin Youngblood Hart played the guitar solos on “We Made It,” sung by Thomas. But the Sisters give these folk songs their warmth, both in their lead vocal performances and in the soulful harmonies where their voices blend so naturally that you might suspect they’ve been singing together all their lives. There’s enough room for each to mark out their own territory, like Thomas’ touch of funk from the traditional fife & drum world, to Russell’s Chicago soul, while Helm and LaVere bring their own versions of Gospel influenced country, while the Como Mamas deliver straight up field Gospel songs, sung a cappella with robust confidence that they are crying out to a higher power who’s going to be paying attention, smartly placed as the last tracks on each side of the vinyl version. And the added beauty of this album, beyond the good feeling generated by all these great female singers collaborating with each other, is that it will likely introduce you to some women artists you may have not encountered previously. Birds of Chicago is great band that deserves a bigger audience, but all of these women do, really. So check out Thomas, LaVere and Helm, and then you’ll likely want to track down their own recordings. 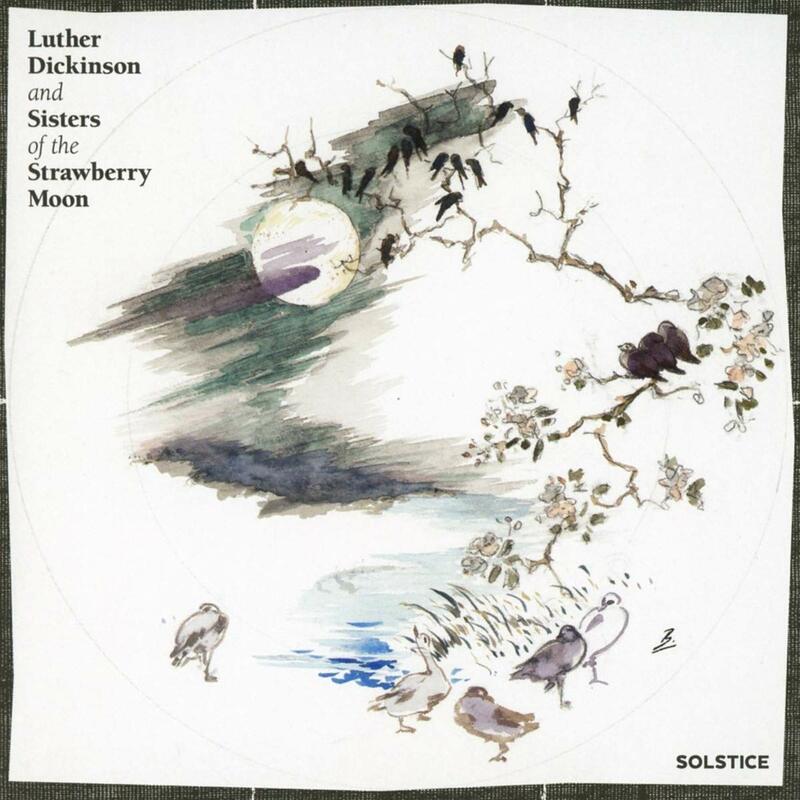 But don’t overlook the value of this lovely collaborative effort, Dickinson bending his talents to serve up these sweet Sisters of the Strawberry Moon, Solstice is one of those sing-along albums that has arrived just in time for those summer vacation drives. It’s a delight.